If you are a Aventura business owner, we at Florida Data Cabling would like to offer you our network services. We are the premier voice and data cabling installers in South Florida. Our technicians are experienced and driven. We are committed to providing you with network solutions that are safe, of high quality, and reliable. Our goal is to help your business have the most vibrant network services possible. The reason why we are so committed to providing excellent service is because we want your business to thrive. We understand the important role that structured cabling plays in the success of a modern business. If your structured cabling system, your network wiring, your phone wiring, or your network cabling does not function properly, your business can grind to a halt. This means that you will lose customers, lose revenue, and lose out against the competition. The Cat3, Cat5e, and Cat6 data cabling services we offer are designed to help you and your business get a leg up on the competition. Over the years, we have helped countless South Florida businesses improve their network systems. We have worked in large markets like Miami, Fort Lauderdale, and West Palm Beach. We have done hundreds of cabling jobs and have countless satisfied clients. 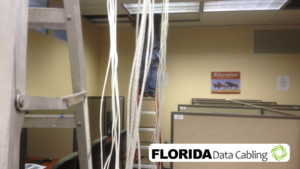 Do not think that your project is too large or too small for Florida Data Cabling. Whether it is just one cable drop or a job requiring hundreds of cable drops, we will bring the same level of skill, attention to detail, and care to your job. We specialize in creating scalable structured cabling solutions tailored to your needs. We have been successful in doing this for many companies across South Florida. We have installed Cat3, Cat5e, and Cat6 data cabling in call centers, manufacturing centers, universities, data centers, offices, and many other locations than benefit from our structured cabling. We work with you from the planning phase of the project all the way down to the end of the project. We will supply you with the cables and connectors needed for the job. We will install and design the job. And, finally, we will test the structure cabling system we install. 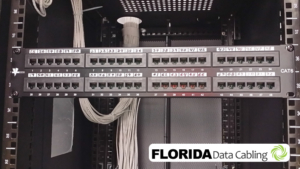 If you are South Florida business owner battling with an old or malfunctioning network system, contact Florida Data Cabling today. We are happy to provide you with our expertise. Our technicians are able to identify the root cause of your problem, be it with phone cabling, phone wiring, data wiring, or network cabling. We will quickly fix the problem and get your business up and running again. We want your business to be successful. We deliver our work on budget and on time with minimal interruption in your daily business activities. We invite you to call us and see for yourself why we have become the premier name in data and voice cabling in South Florida. Contact us. We are happy to schedule a no-cost estimate.